Directed by the duo John Musker and Ron Clements who brought us ‘The Little Mermaid’ and ‘Aladdin’ to name a couple, and written by Jared Bush (‘Big Hero 6’ and ‘Zootopia’), ‘Moana‘ tells a fascinating and adventurous tale of a young woman who is trying to find her lot in life and learn of her family’s past and culture. This young girl is named Moana (voiced by Auli’i Cravalho), who was given an ancient stone or “heart” of the island Te Fiti. It is lost at sea and many years go by as Moana grows into a young woman who has a penchant for adventure an discovery, which her father is not to keen on. The ancient stone was set to protect the island from monsters, demons, and any threat that was posed to the people and island itself. Moana’s grandmother Tala convinces her to set sail and return the ancient stone to Te Fiti, but unfortunately, she will have to cross paths with a sinister and powerful demon named Te Kā. Luckily, Moana runs into a demigod warrior by the name of Maui (voiced by Dwayne ‘The Rock’ Johnson), who has a magical fish hook that can do more than meets the eye. The two set out on this dangerous quest together and in return, find out who they really are inside and become the people they were meant to be. It’s classic Disney story telling to a tee, but it feels fantastic and fresh here with all of its musical numbers, singing, and funny animal characters that come across through its 107 minute run time. The creator of ‘Hamilton’ Lin-Manuel Miranda created the music for the film, and each song is just perfect and fits each moment in the film with emotion and entertainment. The voice acting is outstanding as well with Auli’i Cravalho delivering a nuanced and emotional performance as Moana. Dwayne Johnson brings life to every character he plays, and here he’s no different as Maui. The animation is beautiful on every level and looks life life in many scenes and backgrounds. ‘Moana‘ is one of those films you can watch over and over again and never get tired of it and is one of Disney’s best films to date. 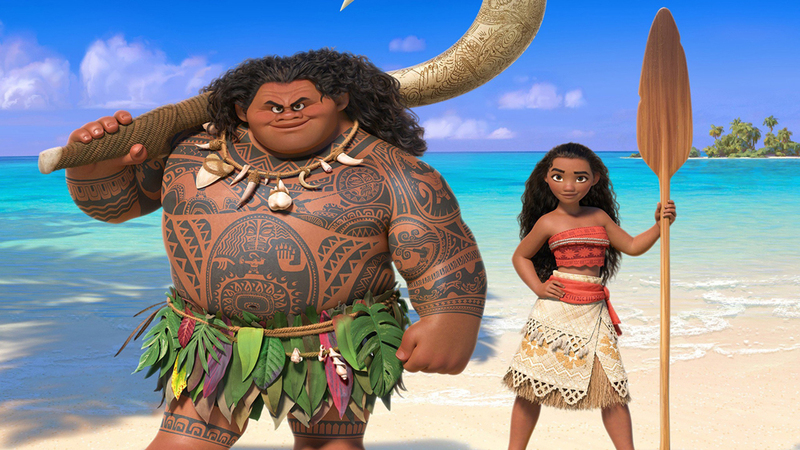 The Video: ‘Moana‘ comes with a 1080p HD transfer and is presented in 2.39:1 aspect ratio. This version comes with both a 3D version, a standard Blu-ray version, the DVD Copy and a digital download. 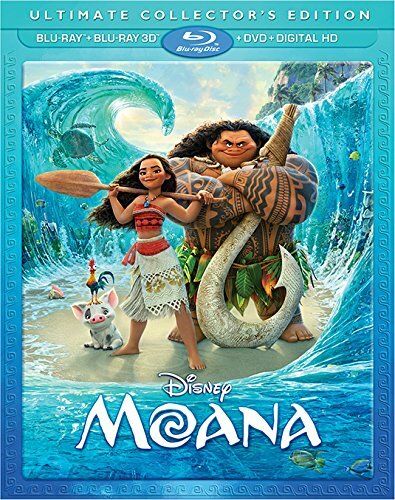 I just wish Disney would get with the times and start releasing in 4K, because I’m sure ‘Moana‘ would look even better than it does in the UHD format. The standard Blu-ray release without the 3D looks simply flawless. Detail of the animation is perfect and natural. The wooden boat and the island trees and sand look impressive with every ounce of detail showing through here. Natural movements in the water, whether it be a calm, serene setting or a violent storm shows the splashes and tides quite well. Colors simply pop off screen at all times, particularly in the sunny days on the water. The bright blues, greens and various shades of orange and red look exquisite and deep. Shading is perfect and background items and colors are bright as well. Individual hairs stick out in the animation as well, which looks life like. Now onto the 3D portion. I’m not a huge fan of 3D and by no means is this a film that begs to be watched in 3D, but it looks great none-the-less. Pop out moments are great and there is some depth throughout with the characters, boat and water, but it’s all unnecessary. Colors look a hint muted through the 3D glasses, but that’s expected. Still, if you’re a fan of 3D, you won’t be disappointed here. There were no video or compression problems whatsoever here, leaving this video presentation with excellent marks. The Audio: This release comes with a great lossless DTS-HD MA 7.1 mix that sounds fantastic. Every sound effect is robust, loud, and full of life with every drop of water and gust of wind pouring through the surround speakers, which provides a very immersive soundscape. The sound effects are life-life and have a ton of directionality as well. Ambient noises of island and ocean life pour through the rear speakers with ease and our dynamic in sound throughout. Every noise is given its due attention here and all sounds great. I will say though that during the heavier action scenes, I expected a bit more powerful sound, but it’s nothing really to get upset over. The music of the film is excellent and always adds to the emotional tone of the film without drowning out any other sound aspect. The low end brings the bass, which is forceful and deep at every turn, without crossing into rocky territory. The dialogue is crystal clear and easy to follow, and free of any pops, cracks, hiss, and shrills, leaving this audio presentation with great marks. Audio Commentary – Filmmakers John Musker and Ron Clements deliver a fun and informative commentary track as they discuss the origins of the story, the character progression, casting, some cameo voices, and how the project came together. This is worth a listen for sure. Voice of the Islands (HD, 32 Mins.) – This is an interesting and great featurette that has the filmmakers traveling to the Pacific Islands to do research for the film. It’s more of a documentary on the life, culture, and geographical area of the Pacific and how it influenced the filmmakers. Great stuff here. Theatrical Short Film: ‘Inner Workings’ (HD, 8 Mins.) – The filmmakers intro the short film, followed by the film itself about daily routines. Great short film that played theatrically before ‘Moana’. Maui Mini-Movie: ‘Gone Fishing’ (HD, 3 Mins.) – A short cartoon of Maui trying to catch his meal for the day. Things You Didn’t Know About (HD, 4 Mins.) – This is a two part featurette that the filmmakers, cast, and musicians, talk about their daily routines and favorite things in life. Quite fun. The Elements Of (HD, 15 Mins.) – There are four different segments here that discuss the background characters of the film, the visual effects of the water, hair, and lava, complete with behind the scenes footage and interviews. Island Fashion (HD, 5 Mins.) – Neysa Bove talks about coming up with the wardrobe for the characters in the film. The Know the Way: Making the Music of ‘Moana’ (HD, 13 Mins.) – This is a great featurette that talks about the music of the film and how it was made. Deleted Song (HD, 4 Mins.) – The song in question is ‘Warrior Face’ and is presented here with animation and an intro by Lin-Manuel Miranda. Deleted Scenes (HD, 26 Mins.) – With optional filmmaker intros, there is a bevy of excellent deleted scenes that you can watch, all of which are worth your time. Fishing for Easter Eggs (HD, 3 Mins.) – Auli’i Cravalho and Dwayne Johnson go through some of the hidden gems of the film for you. ‘How Far I’ll Go Music Video (HD, 3 Mins.) – Alessia Cara’s music video for the song from the film. ‘How Far I’ll Go’ Around The World (HD, 3 Mins.) – The same song as above, but sung in multiple languages. 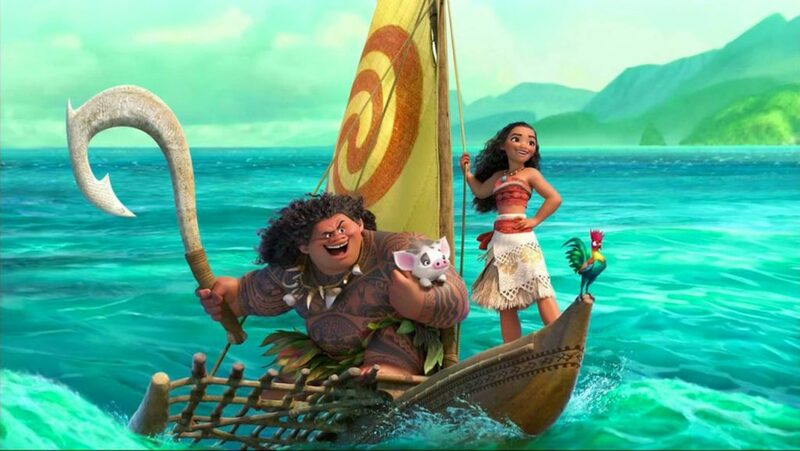 ‘Moana‘ is a great film with excellent characters, animation, and story telling. It’s the classic Disney structure, but still manages to feel original and new with amazing musical numbers. This is one film you’ll be watching for the rest of your life. The video and audio presentations are both excellent, including the 3D version. The extras are outstanding as well and all worth your time. This is a must-own release. The Trailer for Disney’s ‘Moana’ Is Finally Here!!! Enjoy the trailer for Disney’s ‘Moana’! This entry was posted on Thursday, March 9th, 2017 at 10:35 am	and is filed under Film, News. You can follow any responses to this entry through the RSS 2.0 feed. You can skip to the end and leave a response. Pinging is currently not allowed. « ScarJo Features In The ‘Rough Night’ Red Band Trailer!!! Looks like you've managed to cut off our only escape route. [sarcastically] Maybe you'd like it back in your cell, your highness.